For appearing on a short-lived subsidiary – run by Patrick Moore (a.k.a. writer Philip Hoare) – of Les Disques du Crepuscule. 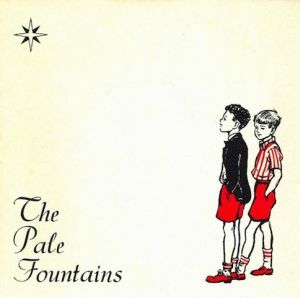 For the simple fifties-era line drawing of two boys in shorts chosen to decorate the cover of a record released at the height of post-punk. For the parenthesis in the song’s title. I like parentheses in song titles. See also the Clientele’s ‘(I can’t seem) to make you mine’. For the angelic voice of the young Michael Head. You should hear his live version of Bacharach and David’s ‘Walk on by’, surreptitiously added as a secret track to the Longshot for your love compilation on which this single also appears. For the way the song begins at a canter and ends at a gallop. For Andy Diagram’s wonderful trumpet-playing, and for the fact that he and Mick are still making music together thirty years later. For the perfection of the sound and the strings – bittersweet rather than syrupy – so confidently included so early in a recording career. First time out, in fact. For being better than the later version on Pacific Street, which is fine in its own way, but being longer somehow doesn’t have quite the youthful élan of the earlier single version. For the fact that there’s always something on my mind too. It’s the perfect song for the natural born worrier who loves fluid, graceful, timeless pop music.